As detached home prices soared despite falling sales, buyers and investors moved over to condos/townhouses. The peak for condo sales occurred in March 2016 at 2252; however peak frenzy was reached when the sales-to-active-listing ratio (SALR) topped out at 94.6% in May 2017. The SALR for condos has been falling since May 2017 is now at a level not seen since 2015. Here’s how it looked for the first six months of 2018. “Greater Vancouver condo sales totalled 1,240 in June 2018, a 34.9 per cent year-over-year decrease and a month-over-month decline of 13.3 per cent. Even though condo sales fell a little harder than townhomes, the stronger seller’s market and more constrained inventory is keeping prices on an upward trajectory – albeit at a slowing rate. The benchmark price for a condo across the region is $704,200, which is 17.2 per cent increase from June 2017 and a 0.4 per cent increase compared to May 2018. 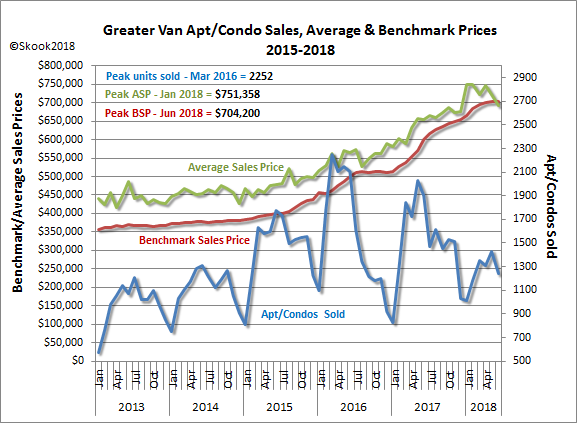 The very long table below (right click on image and open in a new tab) gives a market history of condo/apt sales and prices from 2013-2018. The Benchmark sales price reached a new high in June 2018 but its acceleration is slowing. On the other hand, the average sales is definitely slipping - down -7.8% since February. 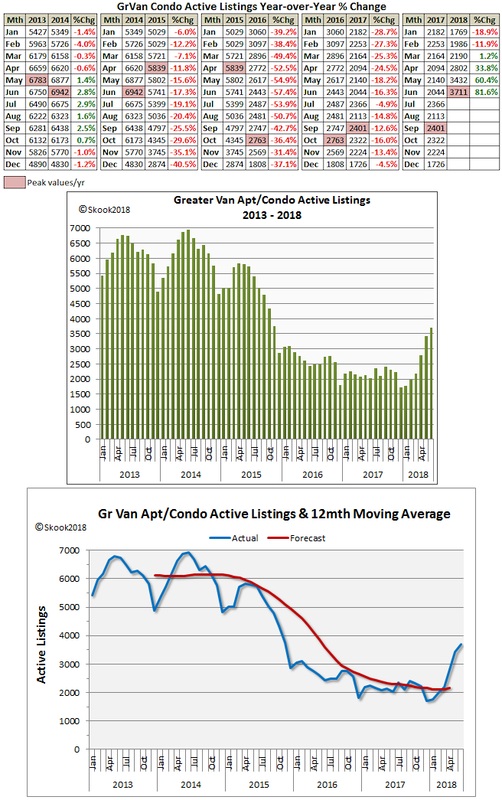 The following table and charts show a definite acceleration in active listings - an almost exponential rise on a year-over-year basis beginning in March 2018 - June’s Active listings were up 81.6% versus June 2017. I wonder how many of these listings were condos purchased in 2016 and are now being flipped as those cheap two-year variable mortgages come due for renewal (at new higher interest rates).